The campaign for the 2009 competition was led by Councillor Peter Lawrence, the BKV Coordinator, and a group of volunteers. Judging took place between 1st May and 24th July. The results of both the BKV and Garden Competitions were announced at a special Awards Evening held at the Village Hall on Friday 13th August. Haughton St Giles Primary School supported the Best Kept Village Competition in 2010. More than 100 pictures and paintings were received for the Children's Poster Competition. From this record number, two winners were chosen, one from the 5-7 age group and one from the 8-11 age group. All entries were displayed on Newport Road opposite the church. Several posters focused on the ongoing problem of dog fouling and these were used around the village to highlight the issue. In addition, the school monitored and recorded the variety of life to be found in the dedicated Natural Wildlife area which has been created in the churchyard at St. Giles. This formed part of curriculum work in Geography, Science and Maths. Shown below is information about some campaigns held before each BKV year had its own dedicated webpage. Prizes for the 2010 competition were awarded at a well-attended Awards Evening held on Friday 13th August 2010. 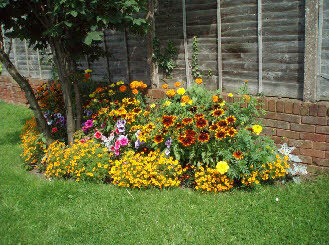 The Garden Competition began in 2009 and has continued every year since then, now also incorporating hanging baskets. 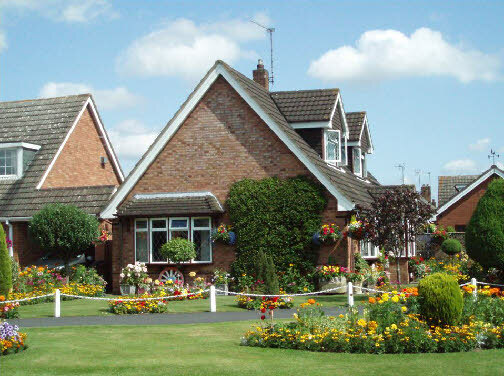 The front gardens of all residents who live within the 30mph limit are judged independently in July. 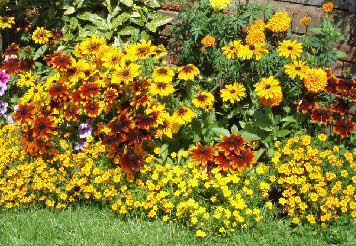 The competition was sponsored by local businesses for the first few years, but is now sponsored by Haughton and District Garden Guild. From 2011 results appear on the BKV page for each year. Below are the results of earlier years.